The groundwater recharge potential in the West Liaohe Plain in northeast China was assessed using a modified chloride mass balance method to estimate the vertical infiltration of water through typical soil profiles at two study sites in the region: the Horqin Left Middle Banner (KZ) site and the Kailu County (KL) site. Samples of precipitation, groundwater, and soil water were collected at the KZ and KL sites to determine the effects of irrigation and soil texture on water infiltration in soil profiles. The results showed that the water infiltration rate at the KZ site is approximately 6–11 mm/a beneath farmland, with similar infiltration rates for mulched drip irrigation and flood irrigation methods, but the infiltration coefficient with a mulch cover was slightly higher than that of soils without a mulch cover. The infiltration rate in soils at the KL site was determined to be 25–41 mm/a beneath farmland and in this area the infiltration rate and infiltration coefficient in soils with a mulch cover were much higher than in soils without a mulch cover. Additionally, the infiltration rate and infiltration coefficient in sandy-textured soils at the KL site were higher than in clayey soils at the KZ site. The infiltration rate in bare land at the KL site with a similar soil texture to that of the farmland was determined to be approximately 16 mm/a, or approximately one-half the infiltration rate measured beneath the farmland. Water infiltration rates in cultivated soils were higher than those beneath non-cultivated areas; however, this does not mean that the actual groundwater recharge rate increased. The amount of irrigation water used is lower using mulched drip irrigation than in fields irrigated using flood irrigation, but the infiltration coefficient actually increased. This suggests that the mulched drip irrigation method can increase groundwater recharge in semi-arid regions such as the study area. The authors would like to thank the anonymous reviewer for the helpful comments, which improved the quality of the manuscript. This research was funded by the National Natural Science Foundation of China, Grant Number 41602247 and Scientific Research Foundation for Young core teachers of Shenyang Institute of Technology, Grant Number QN201713. 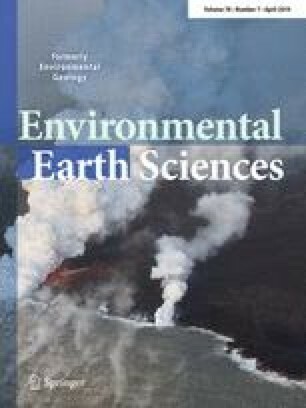 The authors also acknowledge the help from Dr. Wenzhen Yuan and the Project of Investigation and Evaluation of Geothermal Resources in Zhangjiakou Area (No. DD20190129).